Anyone who knows me well also knows that I consider chocolate to be a food group unto itself. And as many of you also know, I live near Cape May, New Jersey. Each December, Cape May’s Mid-Atlantic Center for the Arts & Humanities (MAC) sponsors a spectacular array of events including everything from a Christmas traditions lecture – to evening Yuletide trolley tours to see the lights on the Victorian homes and inns in Cape May – to walking tours of historic Cape May inns – to something called a “Dickens Christmas Extravaganza” – to various and unforgettable food and wine events. If you want to see some of the things the MAC has to offer during the holiday season, you can check out their website here. For many of the past years, we haven’t had the time to enjoy MAC holiday events. 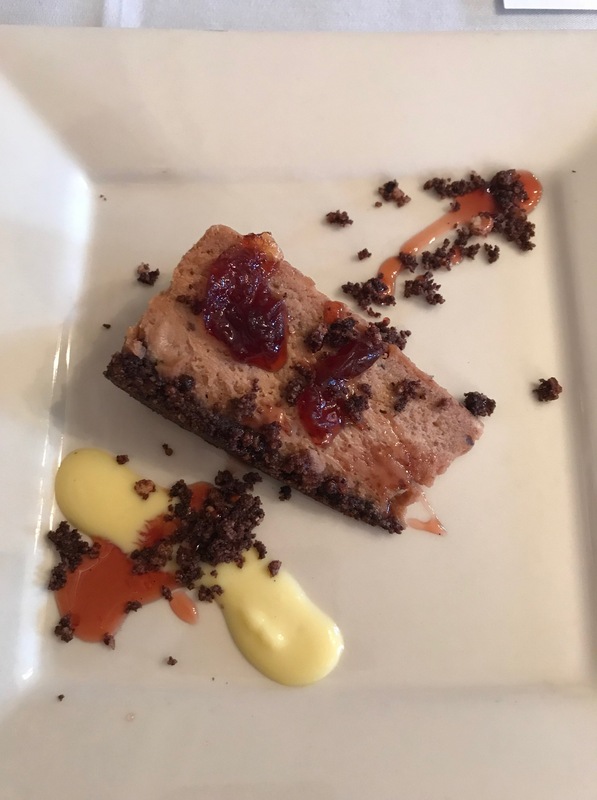 But my husband and I were finally able to attend the Chocolate Lovers’ Feast at The Blue Rose Inn about a week and a half ago. 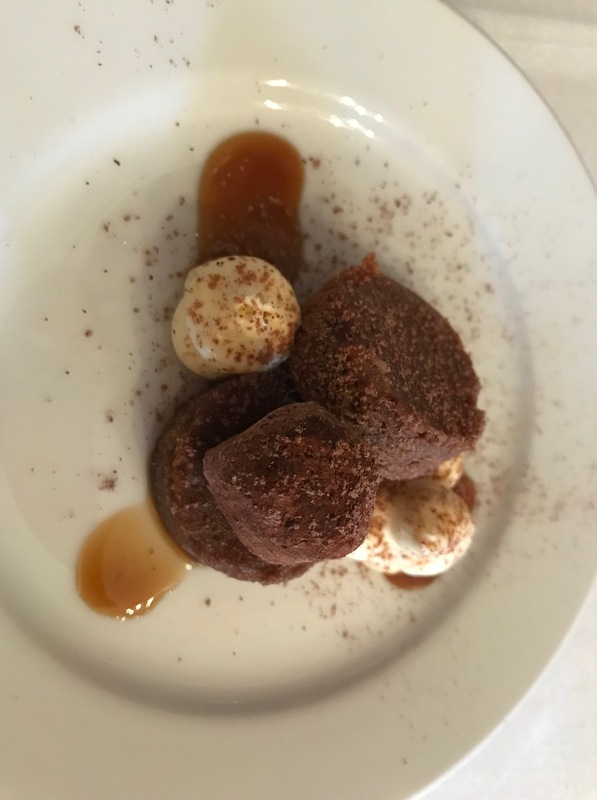 For about 90 minutes, we sat in one of the small Victorian dining rooms at the Inn and enjoyed learning about chocolate and sampling gourmet treats made with chocolate the restaurant sources from Europe. I thought the menu would make a good blog post, so I’m sharing it with you here. 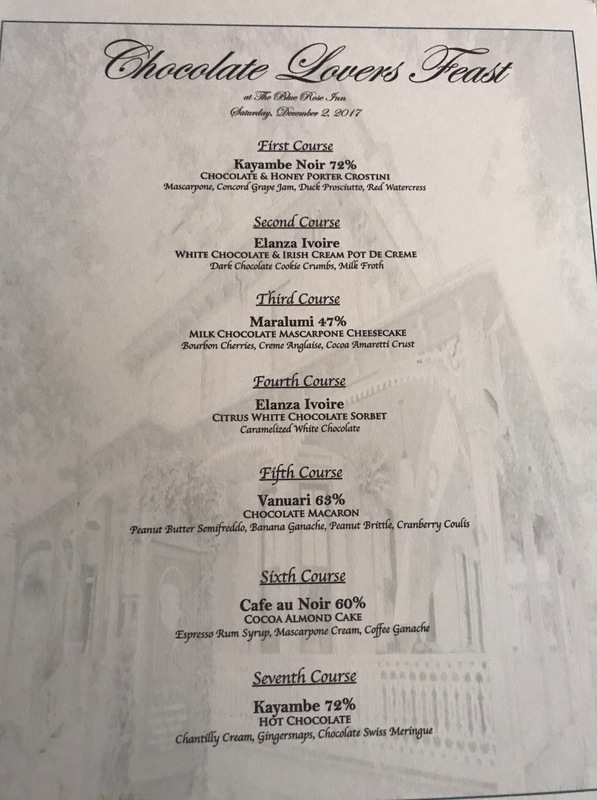 Most of the seven courses featured a different type of chocolate, classified by both cocoa content and the plantation where the chocolate originated in France. It was one of the most unusual ways I’ve ever seen chocolate presented–with both sweet and savory elements included. 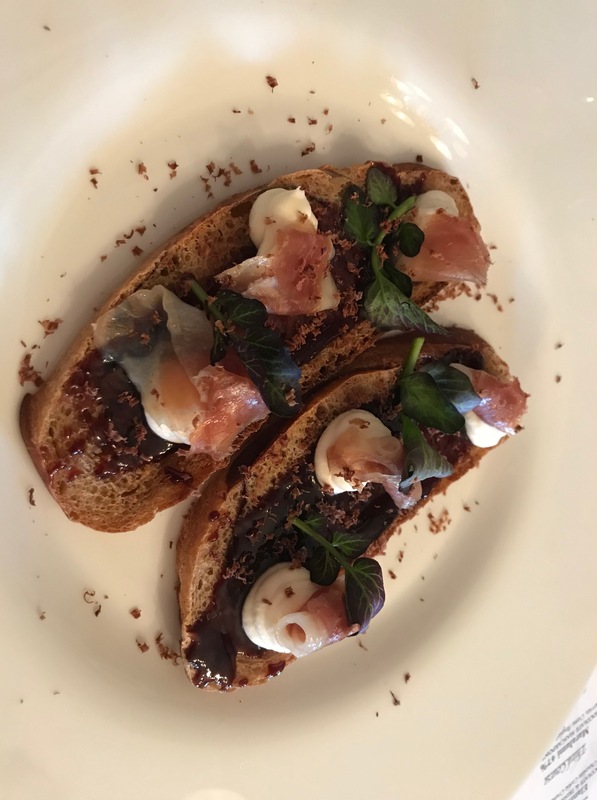 Each of two crispy pieces of Honey & Chocolate Porter crostini were topped with a drizzle of Concord grape jam, watercress, three dollops of mascarpone, duck prosciutto, and dark (72% cocoa) chocolate shavings. In a thousand years I would never think to put those ingredients together, but somehow they worked. I was impressed. Of the seven courses, this was my favorite. 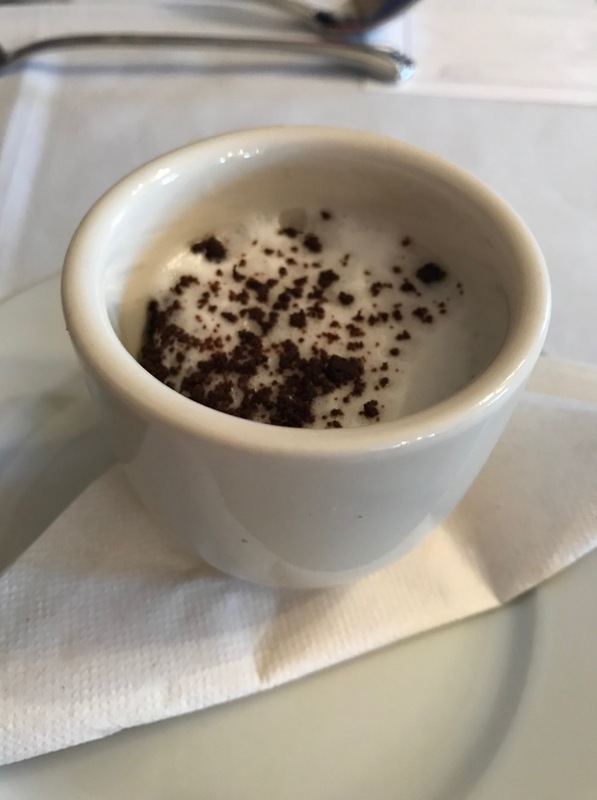 It was a white chocolate and Bailey’s Irish Cream pot de creme with a frothy topping of milk and tiny crumbles of dark chocolate cookies. We ate it with dainty little spoons that forced us to take small bites to savor and enjoy the dessert. If I had been at home, I’m embarrassed to say that I would have eaten the pot de creme in two bites, licked out the bowl, and gone for seconds. The mascarpone at The Blue Rose Inn is made in-house, as is everything else in the scratch kitchen. On its own, it is sublime. When combined with milk chocolate (47% cocoa) and made into a cheesecake that is paired with Bourbon cherries and a creme Anglaise, it is nothing short of heavenly. There was a kerfuffle at a nearby table because one of the guests didn’t want cherries soaked in alcohol; I would gladly have eaten her portion. Those little crumbles you see in the photo are bits of the cocoa Amaretti crust. Palate cleansers are not a thing at my house. If someone asked for a palate cleanser, I would laugh at them. But as part of a chocolatey Victorian experience, it is a must. 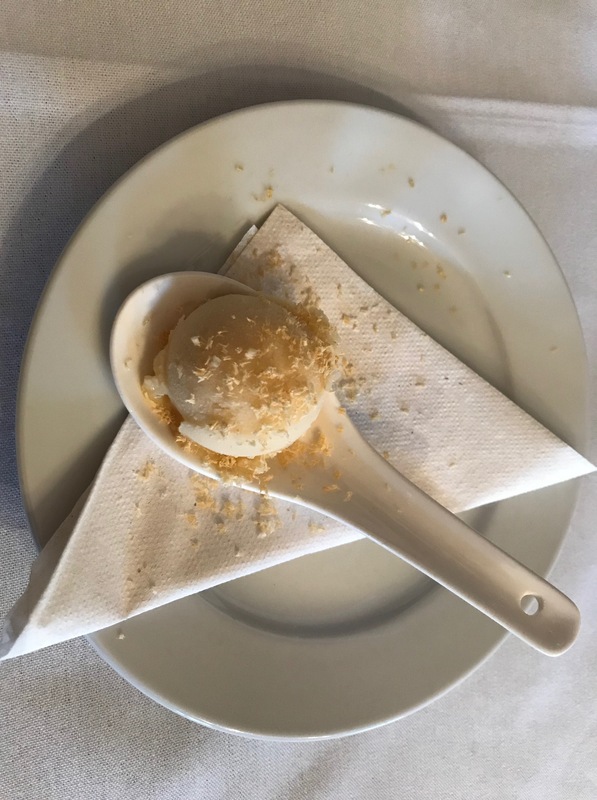 And this sorbet, made with white chocolate and citrus, was perfect. It was tangy and not too sweet. I don’t know why I expected a sorbet to be room temperature, but it wasn’t. The rest of you probably would have known that already, but I can be a bit dense sometimes. This is going to sound like Francophobic vitriol and I hereby apologize to everyone in France, but I do not care for macarons. I know, Mon dieu! But it is the truth. This was one course I did not enjoy. The macarons I have tasted lack strength of flavor, and this one was no different (please note, these should not be confused with macaroons, which I could eat all day). 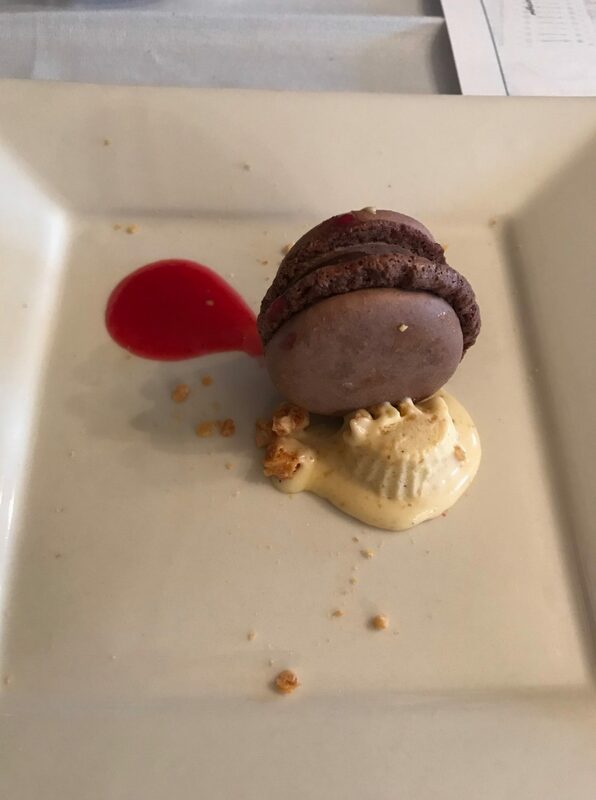 And of all the nuts on earth, peanuts are perhaps my least favorite, so the macaron paired with frozen peanut semifreddo was lackluster. I could see, though, that I was one of the only ones in the room who did not find the dish delectable. P.S. the cranberry coulis was delicious and I would top every Thanksgiving food with it if I could. This was an interesting addition to the feast. 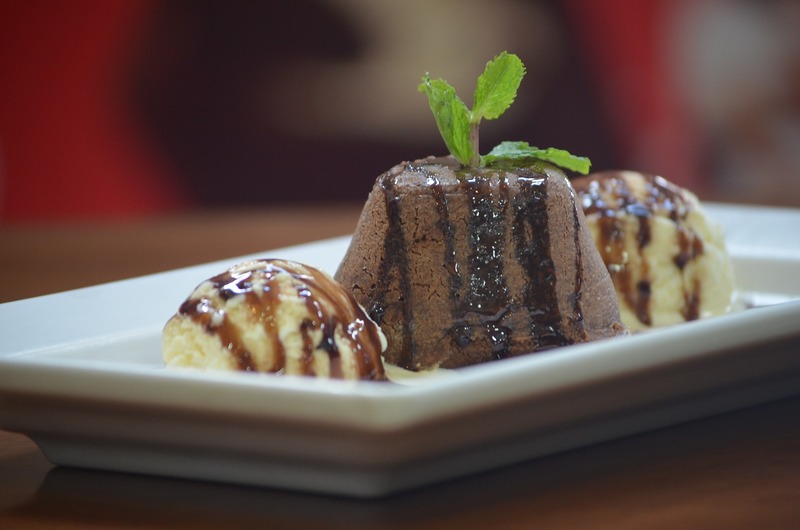 I know coffee and chocolate are traditional pairings, and I also know that a bit of strong coffee or espresso will bring out the chocolate flavor of a dessert. But I don’t add coffee to my chocolate desserts for a reason: I do not like the taste of strong coffee (I have coffee on most days, and I add enough sugar and half-and-half so that it tastes something like ice cream). This offering was not what I would have chosen, as the coffee was pretty strong. But the cake itself was dense and tasty and the mascarpone, as I already mentioned, was wonderful. 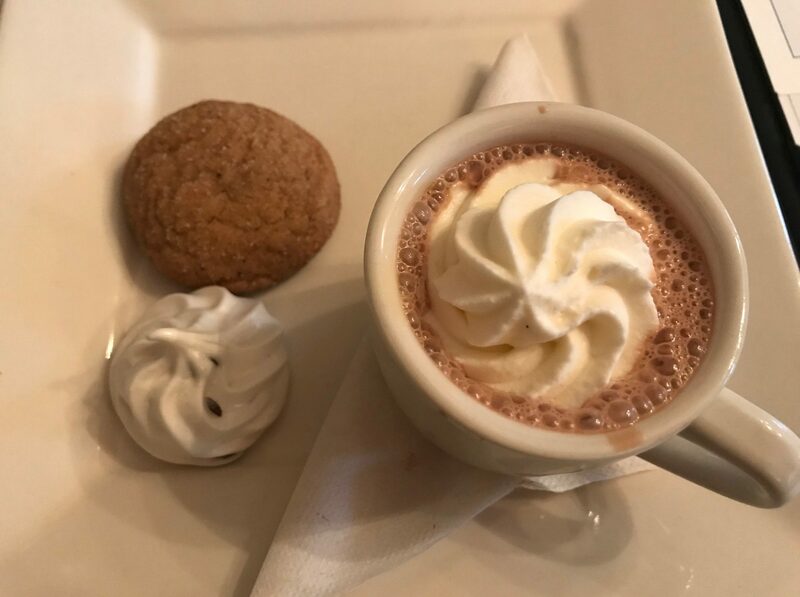 The Blue Rose Inn was brilliant to send us off with a holiday classic–hot chocolate. It was the perfect way to fend off the afternoon chill and the wind that greeted us when we left to return to our normal lives. And this hot chocolate was something special. Made with dark (72% cocoa) chocolate and topped with Chantilly cream, it wasn’t too hot, too cold, too sweet, or too strong. It was, in a word, perfect. I have used sweetened whipped cream a million times in my own kitchen and never knew there was another name for it. From now on I shall call it “Chantilly Cream” and make people think I was trained in Paris. And the meringue and ginger cookie that accompanied the drink? Magnifique. I should note that on the way home, my husband and I each got a free Reese’s Peanut Butter Cup from the gas station/convenience store down the road from our house. We didn’t eat them that day, but they’re gone now and they were delicious, too. To be honest, they’re really more our speed. But our afternoon in Cape May was a great memory and we’re glad we experienced it. I hope you’ve enjoyed learning about my brief culinary adventure. Next week I’m going to take you on a vicarious wine dinner that we also enjoyed as part of the Cape May MAC festivities. For those of you who may not be aware, I’ve been trying to lose weight. It’s not easy. I’m not following any fancy diet or regimen, just eating less and exercising more. I have been building time into my day for more exercising (being a writer, I have a pretty sedentary job). It’s the “eating less” that gets me. I love to cook and bake, so it’s hard for me to avoid making the desserts I love. But I’m plodding along. Not losing weight quickly, but as they say, slow and steady wins the race. Right? 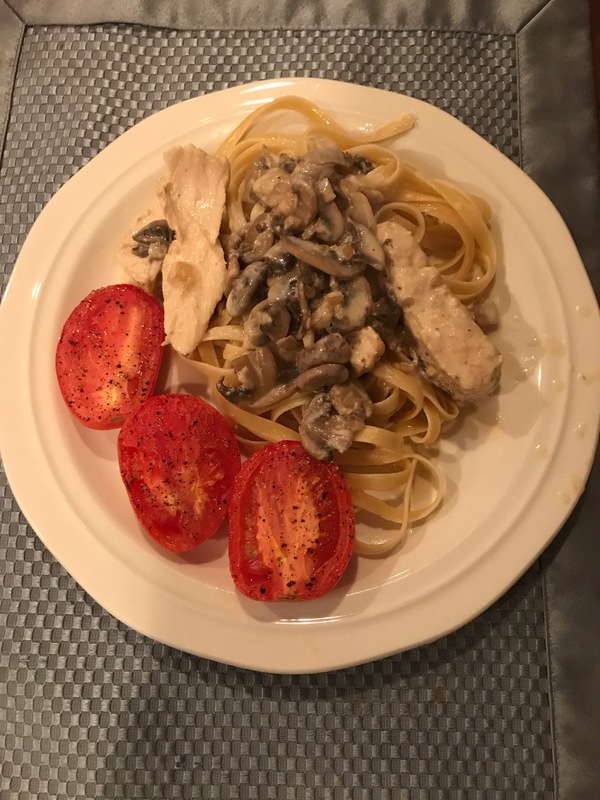 So my post today may seem a little counter-intuitive, but what I’m learning is that by keeping track of the calories I consume, I can budget room for small amounts of those things I love (chocolate and cheese, I’m talking to you) and still keep the pounds off. I’m going to share with you two of my favorite recipes today, both of which still fit into my repertoire as long as I make sure I’m eating healthy (for the most part) and getting daily exercise. One is for a dessert that is pitifully easy and uses ingredients most people have on hand all the time. The other is for a salad that uses mayonnaise, but is so good I just haven’t been able to bring myself to substitute anything else. Preheat oven to 350 degrees. In a medium bowl whisk together flour, baking powder, salt, sugar, and 2 T. cocoa. Stir in milk and butter. In another bowl, mix brown sugar and remaining ¼ c. cocoa. Spread flour mixture in 9” square baking dish. Sprinkle with brown sugar mixture. Pour hot water over entire batter. Do not stir. Bake about 40 minutes. This is best served warm with ice cream or whipped cream. Place cucumbers, chicken, feta, and black olives in a large bowl and mix well. In another bowl, combine mayonnaise, yogurt, garlic, oregano, and parsley. Mix well and fold into other ingredients. Chill before serving in pita pockets. Until next week, everything in moderation!